Re-posted by Voices of Ukraine, with permissions. More than 300 National Guards soldiers protested near the Presidential Administration in Kyiv demanding the overdue discharge from service, payment of salaries and normal treatment by commanders. The authorities assessed the incident as a provocation and violation of the statute. President Poroshenko has proposed National Guard commander Poltorak as a candidate for the Defense Minister Position for approval by the Parliament. The Cabinet of Ministers proposed to eliminate commercial courts, combine the High Council of Justice and the Qualification Commission of Judges and return powers to the Supreme Court within the judicial reform project, as well as to strip the prosecution of general oversight functions. National Bank continues the policy of the exchange rate support via sales of cash foreign currency reserves to banks. Official exchange rate has been established at 12.95 UAH/USD, 16.36 UAH/EUR (-16 cop) and 3.22 UAH/10 RUR (-2 cop). Donetsk Governor Kihtenko decided to move the regional administration to Kramatorsk. 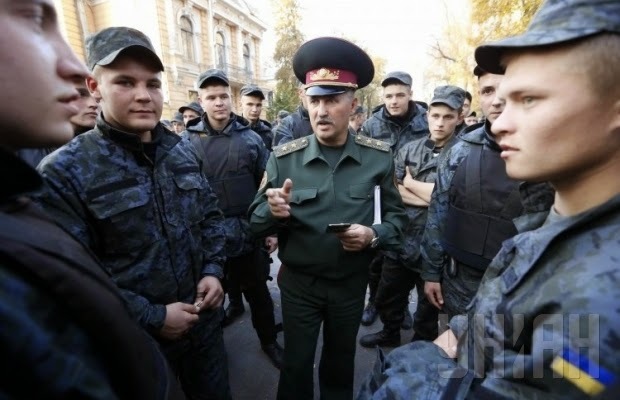 However, headquaters of power agencies will remain in Mariupol. Sociologists from the «Rating» group are forecasting that Porosenko block will get up to one third of the elections votes, Radical Party of Lyashko and «Narodny Front» are on second and third places respectively. In their opinion, the President has support of 48% of Ukrainians. At least 10% of the candidates on the elections lists of political parties are engaged in corruption, as per Transparency International data. 111 senior officers will be dismissed from the Border Control Services according to the Authorities Purification Law. The rights for natural gas extraction in 5 fields and several special permissions for minerals extraction have been auctioned by Ukrainian authorities. Kyiv city train, considered by authorities as an alternative to the development of the new metro stations, have been launched at full scale with the scheduled interval of 15 minutes between trains. Battles for Donetsk International Airport have resumed again. Ukrainian army positions are being attacked and shelled within 5 areas of the Donbass conflict zone. This entry was posted in English, News summary and tagged #RussiaInvadedUkraine, #RussiaViolatesCeasefires, Ukraine. Bookmark the permalink.